Busy Bees Patchwork: My New Year's Resolution. Heather Price is a customer and friend who lives in mid-Wales. I hope that Heather will be a regular Blogger for us at Busy Bees. It will be fun to know what she is up to in her quilting life. My New Year's resolution for 2011 was to tackle my UFOs. Having written a long, long list I started with a quilt which I'd started last summer when I did a special class with Katharine Guerrier, called something like 'Crazy Blocks'. I'd always loved Katharine's quirky designs, and jumped at the opportunity of doing a class with her here in rural mid-Wales. The day didn't disappoint! I loved the blocks I made on the day and very quickly made others at home to make a bright and cheery quilt top. As is my way, the quilt top was put aside awaiting quilting and backing! Thanks to my resolution, now that it's complete, I am incredibly pleased with it. I bought a copy of 'Popular Patchwork' recently which had instructions for a 'Ragtime Pinwheel' quilt by Katharine, and it's high on my list of new projects - I'm hoarding suitable fabrics. At the end of the day I did with Katharine in June, she chatted about other venues where she does workshops, and I was so delighted to hear that she'll do a class at Busy Bees this summer. I sent Sandra my deposit immediately, and look forward to doing my first workshop at wonderful Busy Bees. I'd better start saving NOW for the stunning fabrics they stock in their Aladdin's Cave! Katharine will be at Busy Bees on Saturday June 24th with her 'House Blocks with Attitude' workshop. We do have a few places left, but let us know soon if you would like to come as Katharine is a very popular teacher and the places are sure to go soon. See details about Katharine Guerrier and all our classes on our workshop & courses page. 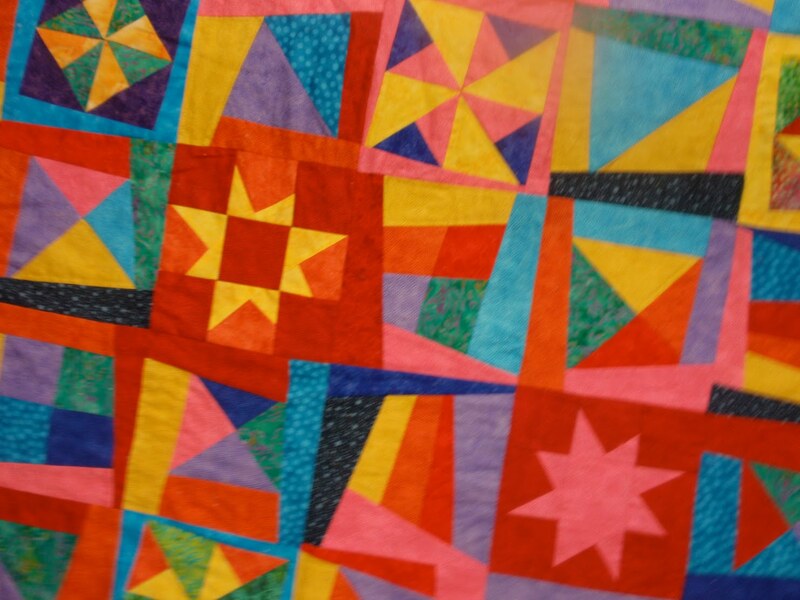 If you have any quilts or quilting stories you would like to share with us, send in a photo and tell us your story. I will pop it on the blog for all to enjoy.